After test driving a 2013 Dodge Dart GT, we were reintroduced to an all-new Dart that is a thoroughly modern vehicle that’s beautifully designed and crafted and is loaded with state-of-the-art technology. 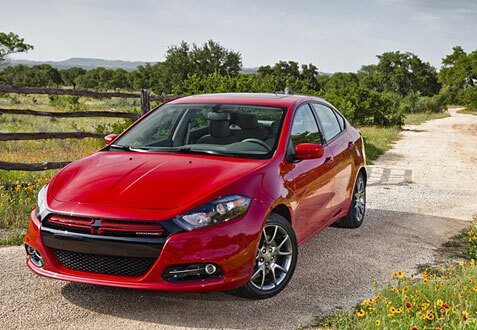 The 2013 Dodge Dart compact car is redefined performance with an agile, fun-to-drive experience, compliments of its Alfa Romeo roots and confidence not normally found in a car in this price range. The Dodge brand dug deep into its rich nearly 100-year history to name its all-new compact car, the 2013 Dodge Dart, and is again drawing on the storied history for the newest Dodge Dart model. The aggressive design is eye-catching and smooth as silk, from the projector fog lamps to the 18-inch aluminum wheels. The header orange cleat coat paint screamed attitude on the road and garnered compliments from folks of all walks of life. Looks matter, and the Dart GT delivers with cues like unique performance front fascia with black accents and hyper black grille, black projector headlamp bezels, body-color door handles, class-exclusive integrated dual exhaust with bright exhaust tips and class-exclusive racetrack LED tail lamps. Our 2013 Dodge Dart GT was loaded with premium standard features including perforated heated Nappa Leather seats, an 8.4-inch touchscreen and 7-inch TFT. The GT model adds standard features like unique premium Nappa perforated leather seats in black with ruby red stitching or two-tone black/ruby red, class-exclusive heated steering wheel (which was welcomed in colder Midwest weather), heated front seats, dual-zone automatic temperature control, remote start (with automatic transmission), universal garage door opener, ParkView rear backup camera, and a class-exclusive 7-inch TFT (Thin Film Transistor) reconfigurable instrument cluster display. Other features include premium door trim panel with soft-touch upper surfaces, leather steering wheel with audio controls and speed control, accent stitching on the instrument panel, power 10-way driver seat including power lumbar support, driver and front passenger seatback pockets, overhead console with sunglass holder, front passenger in-seat storage, illuminated front cup holders, illuminated vanity mirrors, temperature and compass gauge, 12-volt auxiliary power outlet in console, speed-sensitive power locks, power windows with express one-touch up/down front windows, ambient LED interior lighting and automatic headlamps. Clearly one of the sportiest cabins in the compact segment with style you’d expect in expensive sports cars. When you put the letters “GT” after your name, there better be some horses to back it up. 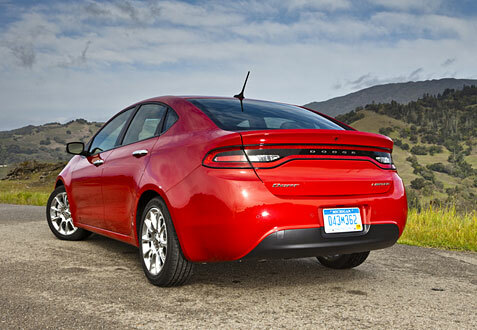 Have no fear, because the 2013 Dodge Dart GT delivers on both power and performance. The Dart GT model as tested hits the mark with plenty of horsepower and a sport-tuned suspension that caters to the driving enthusiast. The 2.4-liter Tigershark MultiAir2 four-cylinder engine, which produces 184 horsepower and 174 lb.-ft. of torque, provides just the right balance of power and fuel efficiency, delivering 23mpg in the city and 33mpg highway driving. The 6-speed manual transmission was superb and smooth, while the sport suspension with frequency-sensing damping shocks delivered ride and handling attributes designed to cater to driving enthusiasts and those who just appreciate a great car. Dodge has become a very serious player in the compact segment with the 2013 Dodge Dart GT, which looks and handles like an expensive sports sedan. What we found amazing was that Dodge delivered all of this for a price as tested of $23,875, which is a serious value. The Alfa Romeo underpinnings gave the new Dart a head start over other new entries in the new car market and it appears Dodge took full advantage of that alliance.